Some of my very favorite friends, JD, Max and their female human Clare are oragnizing an auction to help Shelby recover from some terrible injuries. You can help in many ways, so click on over to check it out! Hi Oskar! Thanks for making the grab button for the auction – we used to know how to do this but have forgotten now that we're older, he he he! 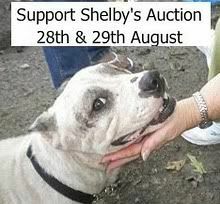 We're looking forward to the auction – it's gonna be a good weekend we feel, there's a lot of generous pups and kitties out there and we sure hope that we can really help sweet Shelby! This is gonna be a grrreat thingy. Thanks fur promoting it.